These fuel shutoff valves are semi-automatic devices for shutdown of natural gas-fueled engines. The valve is opened manually and closes when the electromagnet is energized and trips the latch. The valve can be closed manually by turning the disconnect knob. A normally energized model is available that holds the valve open electrically and closes when the coil is de-energized. A vent in the valve body relieves trapped gas when the valve closes. A pop-out indicator button informs you when the valve is open or closed. The valve’s tripping power is provided by an engine ignition system or battery. Models are available for magneto, CD ignition or 12-/24-V battery. The M2582 is a 1-inch (25 mm) valve with one NPT connection. It has one SPDT snap-switch. The valve body is made of sandcast aluminum. It does not include the open/close indicator button. The M5081 is a 2-inch (51 mm) valve with two NPT connections. It has two SPDT snap-switches. 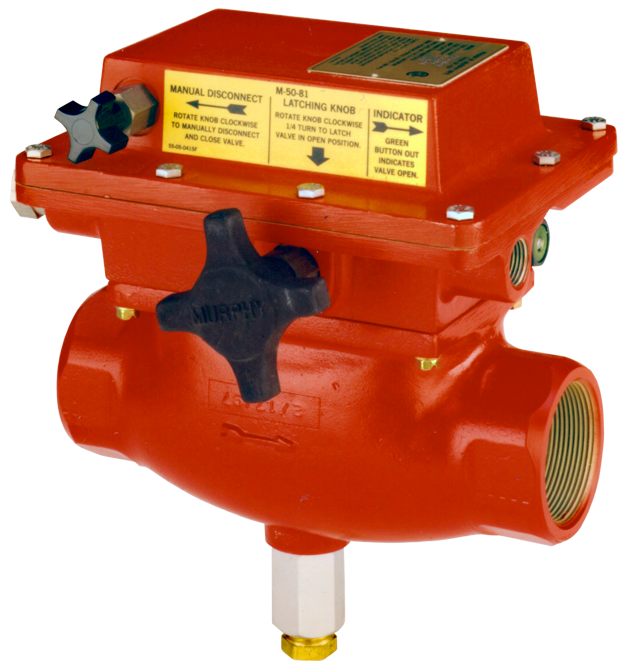 The valve body is available in sandcast aluminum or cast steel (optional). The M5081FS is the same as the M5081 but has a normally energized circuit. This circuit allows the valve to be held open electrically and close by interruption of the coil’s power circuit. A manual trip knob is not available on this model. An optional 2-inch (51 mm) steel flange pipe connection is available for M5081 and M5081FS steel body models (see Dimensions). The FW Murphy 202 V diode package is designed to allow the fuel shutoff valve to be used with dual Magneto Ignition systems. Sold separately (see How to Order). Valve Body: Sandcast aluminum, painted red (corrosion resistance). Optional cast steel available for M5081 and M5081FS models only.